I woke up this morning to an email on the Center for Civic Media mailing list asking about our thoughts on an article. 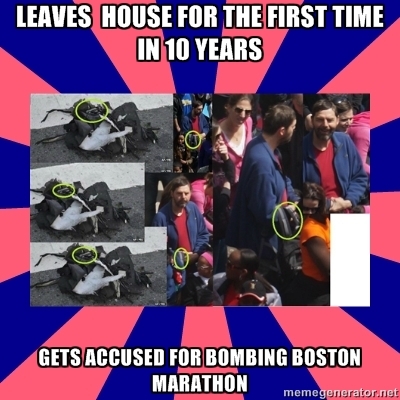 If you follow that link you will see Alexis Madrigal chastising a small Reddit sub-community for attempting to collaboratively analyze photographs of the Boston bombing for clues. His post says, in so many words, "wah wah wah the crowd is acting like a crowd! Don&apos;t they know that they are a crowd? Won&apos;t they please stop acting like a crowd?" Here&apos;s my response: Yes, Alexis, it is. Yes, Alexis, they do. No, Alexis, they won&apos;t. Welcome to the 21st century! Below are the three mini-rants that his post inspired in my brain. His isn&apos;t the first critical take on /r/findbostonbombers. The fine folks of Gawker, who are professionals when it comes to giving Reddit the often-deserved middle finger, already published one and theirs was hilarious. It pointed out all the ridiculous theories buzzing around the web that came from that crowd in language that I can get behind. Most importantly they link to a brand new blue robe guy meme template. See, that kind of response reflects the special unique, inappropriate complexities of the Internet. Having worked in a newsroom for essentially a year I know first-hand that journalists are amazing. The folks at The Boston Globe are doing hard work, and they are doing it professionally. There are many others doing work with an equal level of integrity. But boy, there are so many organizations that seem like they don&apos;t. I won&apos;t even try to list all the instances of public speculation and incorrect statements that came out of "reputable" sources since Monday. Want to know what is more dangerous than a bunch of random people talking on a website? Media outlets with an actual audience spreading false information. Also, media outlets directing global attention to a bunch of random people talking on a website. We can let that one slide I guess. Your post describes an angry mob with no capacity for reasoning or self reflection. Maybe I&apos;m just naive here but it seems to me that as far as mobs go, a reddit / 4chan mob is reasonably honest with itself. This is a point that Alexis decided to casually ignore (and then throw into a footnote in a way that somehow still misses the point). Questions about the appropriateness of the conversation. Reminders that nobody there knows anything. Aggregations of relevant information put out there by the media or FBI. Laughter at how stupid the media is for pointing everyone to their subreddit in their articles about how the community is a bad idea. Someone pointing out things about a picture that sound like a wacky conspiracy theorist. Others making fun of those people for pointing that stuff out. There will inevitably be a few users who take themselves really seriously and act like they know what they are talking about. Those people will be instantly up-voted to the top because everyone knows the internet is serious business. OH WAIT NO THE OPPOSITE OF THAT. The other point that was completely ignored is the fact that there are clear rules plastered on every page. These aren&apos;t just guidelines, they are rules enforced by mods and the core community. If you don&apos;t follow them, your posts get removed and your account can get banned. Note: I said yesterday because as of today any images that aren&apos;t potential pictures of the FBI&apos;s released suspects will be immediately deleted. Realize you won&apos;t stop people from communicating with one another, give up, and go play video games instead. As for blue robe guy? Well, he&apos;s only internet famous because people on Gawker and The Atlantic keep writing posts about him. You heartless bastards.